Young people’s activities in public spaces are being restricted by a series of new council laws. Each PSPO creates new criminal offences, which can be punished by an on-the-spot fine of up to £100, or a fine upon conviction of up to £1000. This means that in several areas young people can now be fined or prosecuted for the offence of standing in a group, and gain a criminal record as a result. Bassetlaw District Council has created a PSPO covering an area in Worksop, which came into force on 18 May. The order prohibits: ‘under 16-year olds (who are not under the effective control of a parent or are responsible person aged 18 or over) gathering in groups of three or more’. The order also prohibits ‘shouting, swearing or acting in a manner as to cause annoyance, harassment, alarm or distress to any person’. See the council’s outline of the PSPO, and local news coverage when the PSPO was enacted. Hillingdon Council has passed two orders targeted at young people gathering in particular areas (‘Hayes town centre’ and ‘Cedars and Grainges’). The ‘Cedars and Grainges’ PSPO prohibits ‘using skateboards, pedal cycles, roller skates, roller blades’. 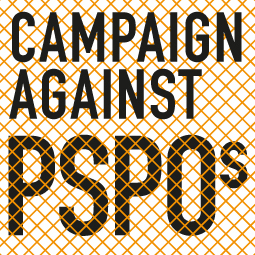 Both PSPOs prohibit ‘gathering in groups of two or more persons unless going to or from a parked vehicle or waiting for a scheduled bus at a designated bus stop’. The orders also give council officers the power to bar individuals from the area for 48 hours: it would be a crime for the individual to return within that period. (See the text of the ‘Hayes town centre’ and ‘Cedars and Grainges’ orders. Hillingdon Council has also passed a ‘parks and public places’ PSPO, which has criminalised ‘using remote controlled model vehicles and aircraft in a manner likely to cause nuisance from noise’, a measure that will particularly affect young people (see the text of the order here). Salford City Council is proposing a PSPO banning: ‘unauthorised water activities in any of the quays, basins or canal’ and ‘jumping off any bridges’. This order – targeted at young people gathering and swimming in the area – would also prohibit ‘causing general disturbance including being abusive to other persons, using foul language, being rowdy and inconsiderate.’ See local news coverage; see the council’s consultation, which includes the planned elements of the order. Bournemouth Borough Council is seeking to introduce an order banning skateboarding in the central square. The council says that the ‘associated clattering and banging’ of skateboarding is ‘not acceptable’. Kettering Borough Council is proposing an order prohibiting ‘unsupervised juveniles’ in the town ‘after 11pm and before 6pm'; as well as ‘misuse of skateboarding, bikes and scooters’ in the areas of ‘Market Place’ and ‘Morrison’s carpark’. See the text of the proposed order. 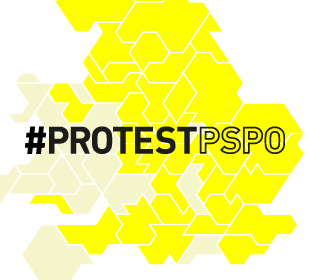 See an open letter and petition against the PSPO, set up by skateboarders. Dudley Council is planning a PSPO covering a particular carpark, which would prohibit activities such as drinking, skateboarding and graffiti. It will also prohibit under 18s from entering the council-owned car park unless driving a road legal vehicle or accompanying a responsible adult. See local news coverage; respond to the consultation. “Swimming and skateboarding are some of the more wholesome activities young people could be spending their time on. Police officers should of course enforce the law, and they and other adults should discipline young people for bad behaviour – but these PSPOs criminalise young people merely for standing in a group or using a remote control car. “There appears to be a growing intolerance of the normal noise and slight disruption associated with young people’s activities. Yet children have always played in public spaces – this brings these spaces to life, and also performs the important function of teaching young people standards of behaviour in public. “We’re really concerned by some of the proposed PSPOs which criminalise everyday childhood behaviours and create totally unfair restrictions on law-abiding children. “There may well be genuine problems in these areas that councils are trying to tackle. However, wide-ranging new laws that criminalise all children, regardless of their behaviour, is not the answer. Blanket bans on children gathering together, being out of the house at certain times, and skateboarding, are illiberal, unfair, and breach children’s rights.